On mother's day, I will channel one of my own mother's tricks for you--a trick for figuring out whether socks will fit without actually trying them on. It works on the principle that people's hands and feet are in proportion. Have the sock's Intended Wearer (IW) clasp the toe of the sock between thumb and hand- grasping as little of the toe as possible. 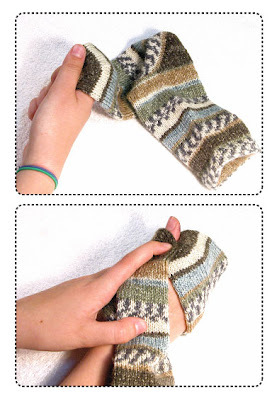 Bottom photo (opposite) Make a fist, then wrap the sock all way around the hand. You are aiming to get a foot length so that the heel will slightly overlap the toe. 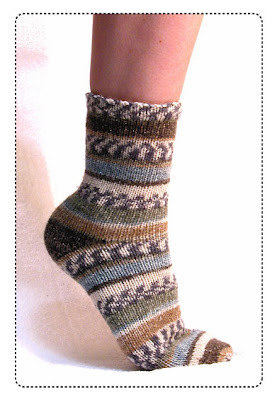 If the heel does slightly overlap the toe, the sock will fit that person. It is true that when in the process of knitting socks, there is not yet a toe to clasp (or, if making them toe up, there is not yet a heel to measure against.) Nevertheless, you can adapt this principle to "try on" socks without sticking your (or another's) feet into a nest of sharp and poking dpn's. The thing to do is to "guesstimate" based on having the IW clutch the sock by the needles, then wrap the already knitted part of the foot around the IW's fist. Don't forget to factor in the toe (or heel) length. The size of the gap reveals the amount of foot still left to knit. This is also a great trick for "trying out" gift socks without revealing what you are making--have the IW shut their eyes (no peeking) and wrap away--if the IW thinks anything, they will think you are knitting them mittens.